March 30, 2017 | posted by Daniela H.
When I got the opportunity to interview at Medix in the summer of 2015, I did as much research as I could on the company to prepare for my interview. That’s when I stumbled across the wonderful organization we came to know and love as Camp Hometown Heroes. As I read about the camp and found out more information about it, I knew that this was something I was going to do even if I didn’t get the job (which, spoiler alert, I did). If you are unfamiliar, Camp Hometown Heroes is an organization that provides a week-long camp for kids aged seven to 17 who have lost a veteran sibling or parent. These children suffer a life-long loss, and Camp Hometown Heroes provides a safe place to heal and find like-minded companions. Around January of 2016, I started thinking about camp again. I figured that they would be looking for their counselors for the following summer, so I went to their website and Facebook page to send over messages requesting information. Almost immediately, I received a Facebook message back thanking me for my interest and asking for my email address. I communicated with Andrew, the director of Camp Hometown Heroes, and he let me know that applications would be coming out soon. I think I bothered him about two more times just making sure he didn’t forget about me, and then I finally got the application around March. I filled it out immediately and sent it back within two hours of receiving the email (obviously, I’m not worried about coming across as too eager). After a phone interview, I received a follow-up call that they wanted me to join them as a counselor that summer! The first couple of days of camp were spent with all of my fellow counselors just learning the ropes of camp and getting to know one another. Finally, the day came for campers to arrive, and you would think it was Christmas morning! All of the counselors were constantly asking the status of when the first bus was supposed to arrive, and we would keep looking over to the road into camp to see if there were any buses driving in. Those poor children who got there first were just swarmed with eager counselors ready to sing songs and play games with them. The week of camp as a whole was amazing. Every morning began with my cabin of 10-12 year old girls arriving in the nick of time for the flag raising ceremony. The flag at camp flew over Arlington National Cemetery, so it holds a special importance for so many of the campers. We would eat some of the most incredible meals I’ve ever had; the chef happened to be a former Top Chef contestant, and the rest of his cook staff, who just also happened to be his whole family, were the nicest group of people. We sang so many silly songs together, fiesta’d during siesta time, and siesta’d during cabin bonding time. Our days were packed with all kinds of fun events ranging from arts and crafts to sling shots to pool games. Unfortunately, I didn’t get to enjoy lunch and dinner as much as breakfast, since the kids were all so busy banging on the tables and chanting like animals for counselors to kiss the buffalo. No, not a living breathing animal in the mess hall! 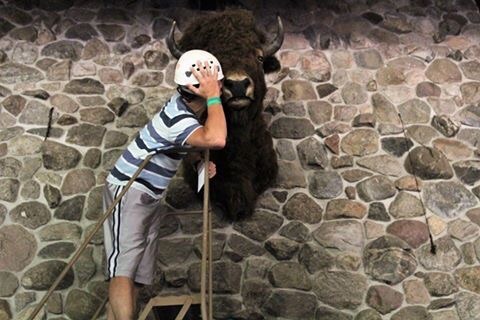 This camp tradition is a sight to behold, as everyone in the room bangs on their table and chants the name of the counselor they’d like to see kiss the buffalo head hanging in the dining hall…for 10 whole seconds! 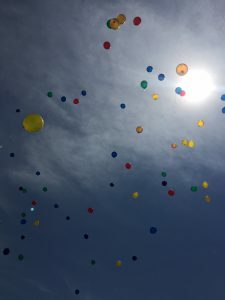 Aside from all of this fun, one of the main things that distinguishes Camp Hometown Heroes from other “grieving camps” is their connection with an organization known as Kyle’s Korner. This Wisconsin-based organization works with children, teens, and their families to help them work through the grieving process after losing a loved one. Each cabin had multiple sessions with Kyle’s Korner where they would do meaningful arts and crafts alongside mental health professionals, and had an outlet and opportunity to talk about and understand what they were each going through. Kyle’s Korner’s services aren’t limited to the designated hour every afternoon; it is available throughout the entire duration of camp. I know that you are probably up there watching all of your little girls growing into beautiful young ladies. I’ve only been able to spend a couple of days with them, but they are the sweetest, strongest, silliest, smartest, and most respectful girls I have ever been around. You would be so proud of each of them. They all love and miss you so much, and I will be sure to give them all a little bit of a longer hug today for you. Needless to say, I made them all cry. The other event is the honor ceremony. In Kyle’s Korner, we spent time making lanterns that had a special meaning for their heroes. 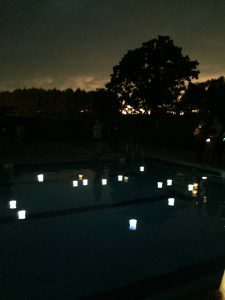 On Thursday night, we all went out to the pool just as the sun was setting, and we floated our candles on the pool. In those moments at the pool, I was at a complete loss for words. I knew that nothing I said would make anything better, but just being there was all I could do at that moment. I had a little buddy from the younger cabin, and she found me and made herself a spot on my lap. We didn’t say much, but we bonded a lot that night. Back at our cabin, my girls were very emotional. One of the girls asked if I could go on our porch and talk with her for a little bit, so I did. She told me all about her dad and their last phone conversation where she got mad at him and told him he needed to clean up his act. He overdosed a few days later. She also told me all about their cat, how she and her mom are best friends, and that her little brother opened up with her about their dad for the first time this year at camp. When we went back inside, we had a good cabin chat with the rest of the group. Most of my girls had lost their dads overseas when they were babies. They didn’t get a chance to hear their voices or laughs or feel what it was like to hug them. One of my girls talked about how she lost her dad when she was 8 years old. She knew him, loved him, and he was her world. It didn’t matter when or how their loved one had passed away, there was nothing to make it any easier of a situation. By the end of the night, we somehow had managed to get the mental health professionals at camp to bring us ice cream sandwiches. All in all, it was really cool to see how much of an impact Medix makes on those kids. When I told people that I was from Arizona, they would ask me how I got involved with Wisconsin’s very own Camp Hometown Heroes (and tell me, “but at least it’s a dry heat!” I’m sorry, but 118 degrees and a UV index of 10 is painful whether it’s dry or not). When I told them I work for a company called Medix, they would rave about how amazing Medix is, and how they appreciate all of the amazing work we do for Camp Hometown Heroes! Hearing their kind words definitely made me very proud and thankful to work with such a great company. 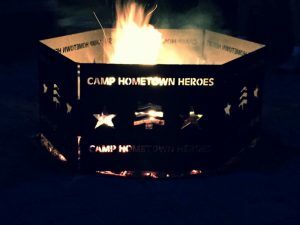 Are you interested in getting involved with Camp Hometown Heroes? Learn more about their organization by visiting http://hometownheroes.org/. This entry was posted in Clients, Currently Employed, Employee Spotlights and tagged Camp Hometown Heroes, Giving Back, mental health, positive impact, summer camp, veterans. Bookmark the permalink.